Many people work in hazardous environments every day. This means they are at a higher risk of being injured on the job. Eye injuries are very common in the workplace. Did you know that more than 700,000 Americans injure their eyes at work each year? Out of the 700,000 injuries, about 10-20% will cause temporary or permanent vision loss. Under Iowa's workers' compensation laws, eye injuries are considered to be a scheduled member injury. Compensation for a work injury varies depending on what kind of injury you have. With a scheduled member injury the amount of compensation received for permanent disability is based upon the impairment rating and the body part involved. For an injury to one eye, the impairment rating is multiplied by 140 weeks. That means that for the total loss of vision in one, 140 weeks of benefits are owed. Also, if you have a previous eye injury (whether it was work related or not) and then you sustain a scheduled member work injury such as an injury to your arm, hand, leg, foot and/or other eye, you may be entitled to Second Injury Fund benefits. It also works in reverse - if you have previously sustained a scheduled member injury (whether it is work related or not) and then injure your eye at work you may qualify for Second Injury Fund benefits. What Are Some Causes of Eye Injuries? 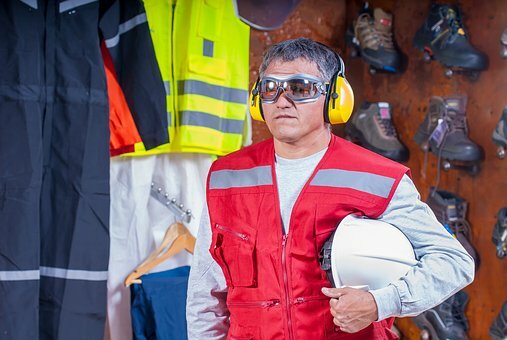 There are many ways to prevent an eye injury at work. Prevention methods all depend on what kind of environment you work in and the potential hazards there. With the right kind of eye protection, the severity of the injury can be reduced by 90%. That’s a huge reduction! There are many high-risk occupations for eye injuries such as construction, electrical work, welding, mining, carpentry, etc. If you work at one of these jobs you need to protect yourself. Understanding all the eye safety dangers at your job can help you to prevent an injury. Trying to eliminate all or as many hazards as you can before starting work will help as well. You also need to use proper eye protection. This may range from non-prescription or prescription safety glasses to goggles, face shields, welding helmets, or full-face respirators. If you work in an area where there are particles and flying objects you must wear safety glasses with side protection. Working near hazardous radiation that is often involved with welding, lasers, or fiber optics would require you to wear special-purpose safety glasses, goggles, face shields or helmets that are designed for the specific task that you are doing. You must wear goggles if you are working with any kind of chemical. To learn more, including the 7 Deadly Mistakes to Avoid if You are Hurt at Work, order a copy of our FREE book entitled “Iowa Workers’ Compensation - An Insider’s Guide to Work Injuries”. Why offer a Free Book? I have represented hundreds of Iowans hurt at work and have seen too many clients make mistakes before they had the “right” information, resulting in them losing thousands of dollars. Iowans hurt at work are now beginning to realize that they should learn about Iowa's work injury laws. So to learn how to avoid costly mistakes and protect your rights Call Now (800)-707-2552, ext. 511 (24 Hour Message) or go to www.IowaWorkInjury.com. For immediate assistance call 515-440-2852 and ask for Corey or Erik.